← “Drain the Swamp” or “Pad the Reptile Fund”? The styles and instruments may differ, but these thirteen artists are all performing variations on the same song: “Usha Bala Elo” by Sri Chinmoy. Judging by the number of recordings, it’s one of the most popular songs among his students. In the very depths of my aspiration-heart. This beautiful song with its simple melody is very enjoyable to sing. Usha means “dawn,” and can also refer to the Goddess Usha, who is celebrated in the ancient Rig Veda, where she is identified with the dawn and described as a bringer of light. In poetry and song, we need not choose a single meaning. We can enjoy the superimposition of the outer and inner meanings. In the outer world, we can imagine the first rays of the dawn softly illuminating the sky, and in the inner world we can feel a new dawn, new light, new consciousness appearing in the depths of our heart. 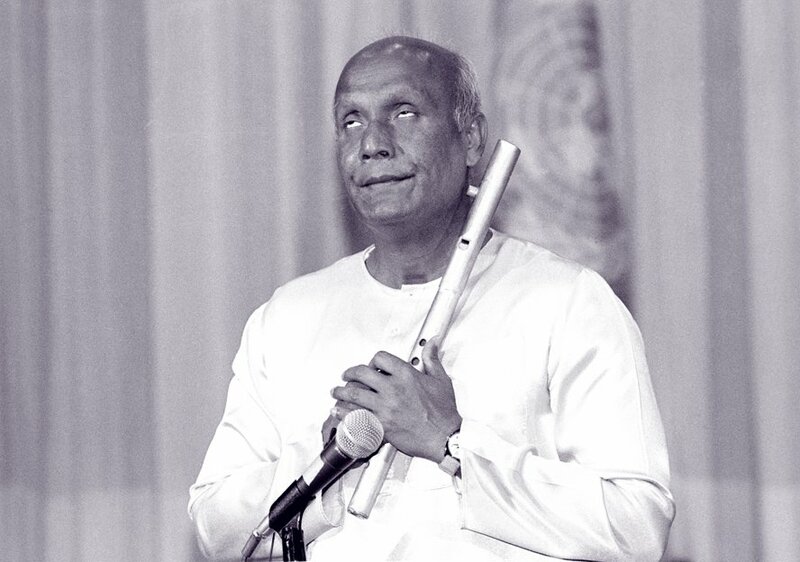 April 13th is a special day for those who admire Sri Chinmoy (1931-2007). On April 13th, 1964 he arrived in the West and began a remarkable decades-long career as a teacher, composer, musician, poet, artist, athlete, and humanitarian. He composed thousands of songs, but “Usha Bala Elo” is certainly one of his most beloved. the door of dawn opens. O children, where are you? Paree incorporates both the original Bengali and the English translation into her choral fantasia, adding a welcome dynamic element to the mix! This year, April 13th happens to fall on a Friday. But after a peaceful morning meditation, we need not surrender to bad luck or Fright Night. The light of the dawn can carry us through to the evening, and at day’s end we can enjoy sweet, peaceful dreams.